What is the Food & Community Hub? The Hub has replaced The Basic Idea food bank, which has been helping our neighbours in crisis for the last 10 years. The biggest immediate difference is that we are no longer providing a delivery service, so once you are referred for a 3 day allocation of crisis food, it will be available for pick-up from the Food & Community Hub. The Hub aims to be a place of welcome and hospitality with new support available, above and beyond the crisis food parcels. Universal Credit and other benefits, housing issues, managing debt and so on. There is access to the internet for online accounts and job search, and there is free tea, coffee and snacks and a place to sit and chat. Access to the crisis food parcels still requires a referral, but if you would like to benefit from the other support or simply have someone to talk to, then you are very welcome to drop in. If there are steps you want or need to take, or have barriers to overcome in your life, then there is a listening ear and a positive desire to support you on your way; we are simply your neighbours, as you are ours! When is the Hub open and where is it? The Food & Community Hub is open between 12pm and 2pm every Tuesday and Friday with the exceptions of Bank Holidays. As you head North from the town centre, you will find the Hub inside the Baptist Chapel on Bridge Street in Belper; we are nextdoor to the Devonshire and opposite The Rifleman’s. 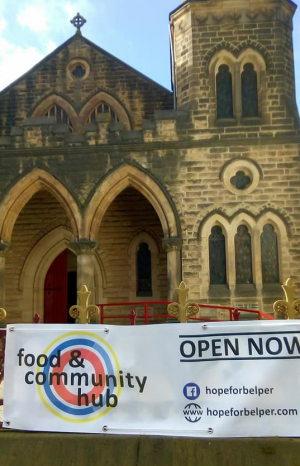 When we are open there will normally be a banner with the Food & Community Hub logo clearly displayed on the railings outside – just come straight in – we don’t bite.